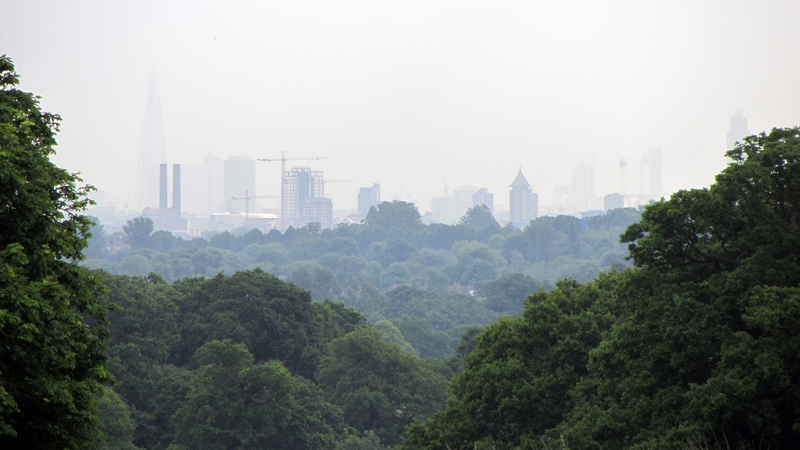 The view from Sawyers Hill in Richmond Park, through to central London. The Shard, the cranes in the thundery morning of Thursday June 4th. I was up in the park to meet a bird recorder and illustrator. Together we have been working on the Song Thrush ‘species action plan’ in Richmond Borough asking people to send in sightings, as well as gathering our own recordings of this red-listed species. As I headed down the hill to meet him to compare notes, I stopped to look through to London. It’s an amazing view. At this time of year, it’s thick dark green view. So many leaves. How many trees are between me and The Shard? 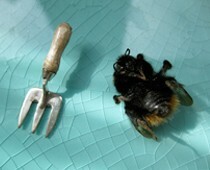 The houses, streets and people, birds and insects are beneath and in amongst this layer. ‘Recognised as one of the world’s most important urban habitats, green, blue and open spaces occupy over 60% of London. Over 1,300 Sites of Importance for Nature Conservation cover 19% of the National Park*. Londonwide the capital is home to more than 1,500 species of flowering plants. 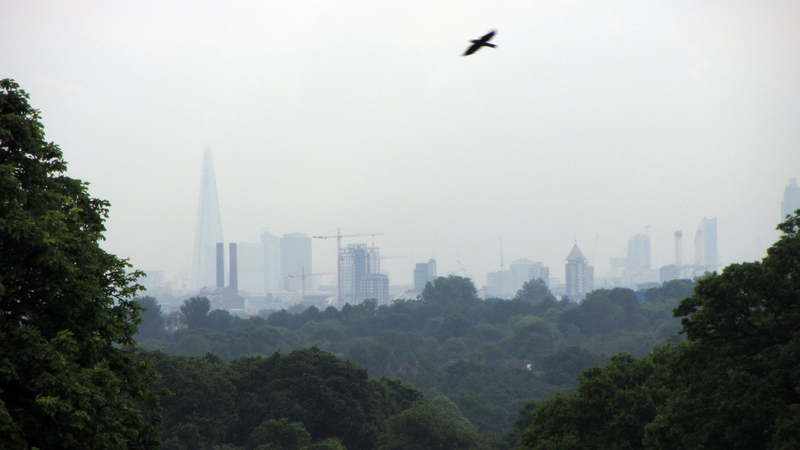 More than 300 species of bird have been recorded in the city … Greater London is over 1,500 km2 and home to more than 8 million people‘. It’s one of those ideas that brings things spinning into relation, giving coherence and value to the fragmented attention given to the green and blue networks and spaces in the capital, and gives agency to the growing forest school and wild education movements for outdoor play for children. It brings focus to the whole ecological sphere and species interactivity of this dense city. 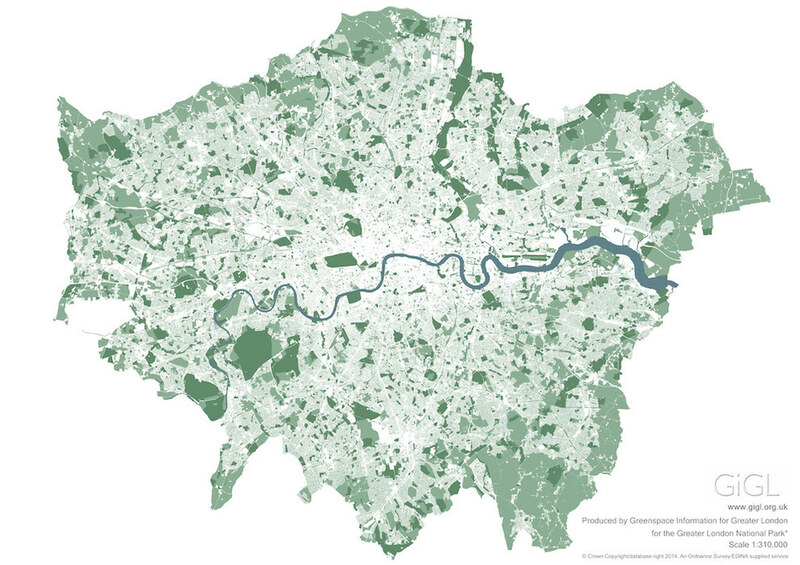 Here’s a map generated by GIGL (Greenspace Information for Greater London) showing Greater London.